The demolition of parts of Birmingham&apos;s 1960s New Street station is a success story for West Midlands business, according to the £750 million project&apos;s director. 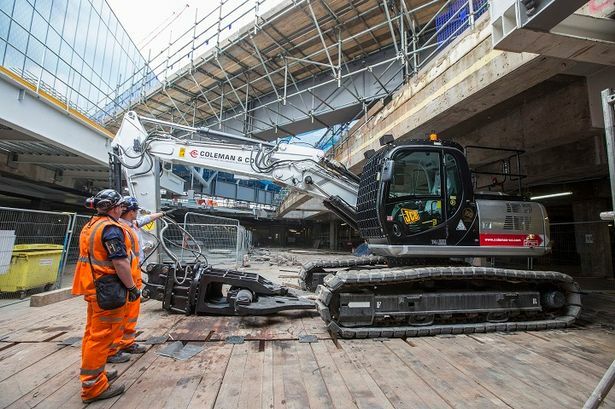 Birmingham demolition firm Coleman and Company and world-famous digger manufacturer JCB have even made a concrete "muncher", specially designed with a low hydraulic arm to squeeze between New Street&apos;s levels. Project director Chris Montgomery said: "This muncher was specially made for the project to get under the low roof. We needed a low vehicle but without losing the hydraulic power and they came up with this. "It is two West Midlands companies working together that have come up with this. A success story for the region." For the first time in more than 45 years natural light is bathing the passenger concourse area of New Street Station after demolition crews broke through its thick concrete ceiling in the final major structural work on the transformation of Birmingham&apos;s premier rail station. And what is a small hole now will, by February, be a wide open space creating a bright and airy space for passengers when the works are complete and the station fully open to the public next September. For generations passengers have complained about the dingy concourse, the ticket office and fast food concessions, where people mingled under artificial light awaiting trains. Between now and February, specialist demolition machinery will be crunching through the wide concourse ceiling and removing the vast quantities of concrete. Mr Montgomery added: "This is a huge engineering challenge, taking some 6,000 tonnes of concrete out while working above a live railway station. As our work to transform New Street station continues, excitement among our 1,000-strong workforce is really starting to build. "Piece by piece, the design and concept for the station is being brought to life and it&apos;s great to see natural light reaching the concourse for the first time." Mark Coleman, managing director at Coleman & Company, said: "To demolish 6,000 tonnes of cast reinforced concrete from the centre of a busy city centre construction site, above a live operational rail station, without noise, dust and disruption is a huge engineering challenge. "Some of the beams we have removed weigh more than the equivalent of 30 Range Rovers. Our engineers have been working closely with Network Rail and Mace, assessing the structure and crunching the numbers, to ensure that all works are completed to the highest standards." On the floor above the concourse and already taking shape under the steel structure of the giant atrium roof is the Grand Central shopping centre and flagship John Lewis department store, both set to make New Street a destination in its own right. Some 60 retailers and restaurants, many already signed up, will fill the shopping area. Grand Central development director Richard Brown said: "This is a major milestone for the project as we work towards next September&apos;s station opening. We are slightly ahead of schedule. We expect the demolition to be completed by February and then we will start to develop Grand Central Birmingham." Sir Albert Bore, leader of Birmingham City Council, said: "This is a really momentous occasion in this project. One of the main drivers for redeveloping the station was to create a lighter, brighter first impression when people come to our city and this breakthrough is the first sign of how this will happen."